As I write this it is 72 days, 12 hours, and 28 minutes till my first marathon. Training has been very different than anything I’ve ever done before, and I’m learning new lessons every day. Here are a few things I’ve learned thus far. I’m sure I’ll update this in weeks to come. Plan for a spring race. Long runs + South Mississippi summers = one unhappy old broad. Toenails do grow back. But, it takes a long time & a really good pedicure is no longer a luxury, it’s a necessity. Lose the weight you need to before you start marathon training. There is no time to focus on a weight loss plan during training and the lighter you are, the faster you run, and the easier the load on your joints. Stilettos are for younger legs. Anyone who has peeked into my shoe closet knows exactly what this statement cost me. It’s as much a mental exercise as a physical one. Maybe even more so. Training my mind to not let my body tell it what to do has been one of the hardest hurdles to overcome. Ice baths and foam rollers are my new best friends. Actually, it’s just a cold bath. I rarely put ice in it. According to Jeff Galloway, it just needs to be 20 degrees cooler than my body temperature. Foam rollers are that friend that you really don’t like all that much, but you know you have to include in your circle. May I just say “OW!” and “Oh My Gosh, that hurts!” But, I’m a better person for getting to know them. You don’t have to “carb load” before a long race or run. In fact, for those of us with GI issues, it’s probably a really bad idea. The week before my long runs, I eat fairly normally, with a conscious effort to eat less fiber filled foods. The 36 hours prior to the run are the critical time, and I really try to concentrate on balancing proteins and simple carbs, no alcohol, and no high fiber foods. The morning of the long run/race, I only have a little water before I head out. Every 30 minutes I eat 30-40 calories, followed by a few sips of water. Tummy issues resolved. We’ll see if this formula continues to work. Really long runs require a lot of planning, especially in the heat of the summer. An early start is critical. Try going to new places to help overcome the mental hurdles. Going to Starbucks after a really long run in the heat won’t make you popular with the other customers. But, they will step away from you and allow you to get your coffee first. Do what you have to do. IT’S OKAY TO WALK!!!! I’ve really struggled with this one, but, it’s not like I’m going to win, anyway. It feels like you aren’t a “real” runner if you don’t run every step. But, I think I’ve finally grasped the concept, and I know that Run Walk Run really helps with fatigue and injury prevention. I love the Bart Yasso quote I’ve included here. If you don’t know who Bart Yasso is, Google him. He’s kind of a big deal in the running community. Gary & I went kayaking Friday. We usually go once a week, but I have been out of town or sick the last couple of times, so I was really looking forward to this week’s float. After my last long run, the sore throat and vague body aches that I had been feeling blossomed into a full blown viral infection that started in my throat, then traveled to various other body parts and left me weak, grouchy, and exhausted. I’m not sick very often, so when I am, I have a tendency to become more whiny than usual and wonder if I’ll ever feel good again. Yes, I know that’s a little melodramatic, but, as the daughter of a true “Drama Queen”, believe me when I say that I could be a lot worse. Really. Anyway, we left early Friday morning and headed south to the “Wild and Scenic River” in our area – Black Creek. It was a really nice day, and we’ve done other parts of this float before, so I knew it would be a great treat. The water level was low and there were a lot of trees down, so I knew going in that it would be a little more work than usual, but that was okay, too, as I was ready for a workout of some sort. We launched easily and started the lazy float downriver. Artillery fire from Camp Shelby punctuated the start of our trip. I guess they didn’t get the memo to wait until we were done with our float to start artillery practice. But, I didn’t mind. It just sounded like freedom to me. Soon, our usual white egret guide began leading us, flying from one post to another to alert us to any dangers we might face around the bend. It stayed with us until about the midway point, then relinquished its duties to a second pair of snowy white birds. We saw huge herons, lots of fish, and I think I heard a wild pig rooting around on the bank. No alligators or snakes this time, though. Thankful for that. As we came to shallow sections and log jams, we manuevered through them, or got out and pulled. Not having Gary’s upper body strength, I resorted to getting out more often than he did. I usually get out rather than power through log jams, as I have a mild fear that a snake will drop out of the tree limbs and into my boat. Don’t laugh. It could happen. As we floated, there was a deep abiding silence. Even the artillery fire subsided as we floated further away. I reflected on how life if very much like this river float. Long stretches where we glide along, buffeted by work, school, social functions, sports. Easy times when laughter is plentiful and sleep comes fast. Then there are those times when life gets shallow and caught in log jams, and we have to get out and pull. Much more effort is required, and it’s so much easier when we’re not alone and we have the right tools for the job. My kayak has a pull rope on it that gives me leverage as I pull it through rocks and sand. It is attached to the front, and just lies there waiting for me to grab it when I need it. My life has a pull rope, too. My faith in Jesus Christ. He’s the One who assists me through those shallow, rocky spots in life. He’s always with me, waiting for me to reach out and grab hold, providing solid leverage against an uncertain world. I truly don’t know how those who don’t have Him make it. Many don’t, of course. Some turn to poor substitutes like drugs and alcohol. I’m so thankful that I’m not alone during the tough times. I’m thankful, too, that He has brought people to my life who help me through. Our morning worship today included the song I listed as the title of this post. It is one of my favorites, an old, old song that has solid truth in every line. Then, our pastor led us in worship with a reminder that we need each other and should seek relationships with other believers who become our accountability partners, friends, and family. People who will reach back and pull you through when you’re stuck in a log jam. People who will reflect Jesus to you. I am feeling better, finally. I ran early this morning, before church, while Gary rode his bike, and it was a very good run. I’m still not 100%, but I’m getting there. I’m so very thankful that God has brought running to my life. I pray that I’ll be the 90 year old age group winner of the 2051 NYC Marthon. Don’t laugh. It could happen. It is, truly, well with my soul. If the running community had a royal family, Jeff Galloway would definitely be a member of it. He has been running for 52 years (longer than I’ve been alive! ), and has been making his mark in the running world for most of those years. He developed the Jeff Galloway Run Walk Run program and has been teaching/coaching runners how to be injury free runners for life for many years. 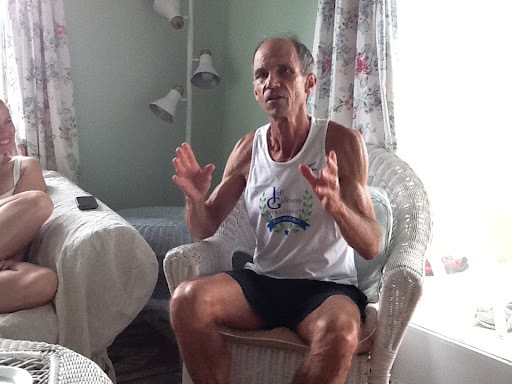 He has trained thousands of runners and has written many books on the subject that offer training programs for any distance for which you might want to train. I found Jeff’s training program as I was searching for one that would take me to the NYC marathon in a conservative, long term fashion. I embarked on it, making my own modifications to it to customize it for me. As I was doing some online research, I stumbled across Jeff’s website & discovered that he offers running clinics/retreats all over the country, and indeed offered one just a few hours away from me in Blue Mountain Beach, Florida (a town name that’s filled with irony). I promptly signed up, and have counted the days with eagerness as I continued my training. If you follow my blog, you will know that my long runs have been nothing short of torture over the summer. So, it was with a great deal of anticipation that I headed to Blue Mountain for our first session. Jeff’s teaching style is very low key. We started with introductions and a short run around Blue Mountain, then went back to the beach retreat for some running discussions. Instead of a classroom setting, we sat in the living room and had questions and answers with Jeff offering tons of helpful information. Saturday morning started with a 3 mile run along a beautiful, shaded trail, followed by more instructional time, then drills outside and a dip in the pool to talk about pool running. Sunday morning’s run dawned a little earlier to try to beat the heat, then more question/answer time as we wrapped up a very motivational & instructional weekend. We discussed everything from black toenails, nutrition, heat running, speed training, and even the 1972 Munich Olympics. Jeff weaves stories from his experiences that include running greats such as Steve Prefontaine and Frank Shorter. Great stuff! Jeff offered specific advice for each of us, based on our goals and experience. I’ve struggled with long runs in the heat and GI distress on all runs and he had some excellent suggestions that I can’t wait to implement. This weekend was the confidence boost that I needed to get me through the weeks leading up to NYC. Welcome back, running mojo!! I’ve missed you, old friend!